How Essential Was the French & Indian War to the American Revolution? How did the Constitution, the Marshall Court, Hamilton's Economic Plan, and the War of 1812 combine to create a sense of nationalism? • We reduced the number of exam questions by removing one short-answer question. Students will have 10 more minutes to answer the document-based question (DBQ) and long essay question. • We now specify which periods will be the focus of the free-response questions. • We streamlined the practices and skills that are assessed on the exams. 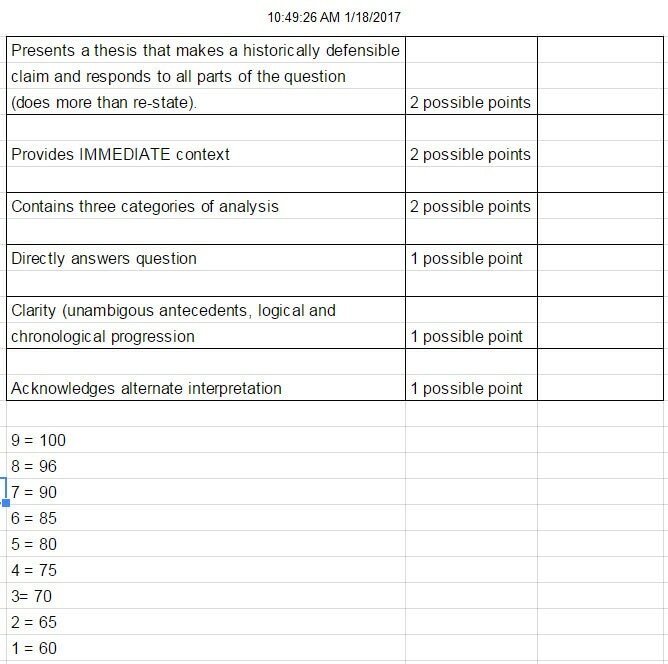 • New long essay and DBQ rubrics—featuring simplified language that clarifies the tasks students need to accomplish in these timed essays. We streamlined the AP history disciplinary practices and reasoning skills (previously known as historical thinking skills). Periodization and synthesis are no longer listed as course skills. The practices and skills are now defined in clearer, simpler language and reflect a range of student proficiency levels. See the AP history disciplinary practices and reasoning skills. We updated Section II of the AP history exams (document-based question and long essay question) and the generic rubrics. The synthesis point has been removed from both rubrics. Students will have 10 more minutes to answer the DBQ and long essay question. A single rubric will now be used for the long essay question. The rubrics describe more clearly what students will need to do to earn each point. Sample AP questions and scoring guides from the College Board. Study skills and test-taking tips from the College Board. A list of AP U.S. History study guides. This site provides over 1600 notecards for AP U.S. History students. resources that will help students prepare for the AP exam. folded with questions on one side and answers on the other. The Leitner System is a method of studying flash cards based on the premise that The easier it is to recall the material on a flashcard, the less often that flashcard should be repeated in the future. The more difficult it is to recall the material on a flashcard, the more often that flashcard should be repeated. Note: AP U.S. History Flash Cards can be purchased from Kaplan AP, Barron’s AP, and CliffNotes. Christopher Lee Publications, Inc. a U.S. History Baseball Game and a U.S. History Timeline Game that can bring a little fun into helping students review for the AP exam. An important part of the AP U.S. History examination is the document-based question, or DBQ. This question will present you with approximately documents (everything from journal entries, speeches, court cases, and artwork) that you will have to accurately interpret to write a suitable essay. Two techniques may help you with your analysis; they are the SOAPS and APPARTS methods. 1. S=Subject. What is the document talking about? 2. O=Occasion. What was happening at the time the document was written? What was going on in the author’s life? 3. A=Audience. Who is being addressed? How does the audience affect the purpose of the author? 4. P=Purpose. What type of action or reaction does the author want the audience to have? 5. S=Speaker. Who is doing the speaking or writing? 6. +S=Significance. What is important about this document? 1. A=Author. Who created this source? What do you know about the author? What is the author’s point of view? 2. P=Place and time. Where and when was the source produced? How might this affect the meaning of the source? 3. P=Prior knowledge. What do you know about this topic that would increase your understanding of this primary source? For example, do you recognize and recall the meaning of any symbols? 4. A=Audience. For whom was this source created and how might this affect the reliability of the source? 5. R=Reason. Why was this source produced, and how might this affect the reliability of the source? 6. T=The Main Idea. What point is the source trying to convey? 7. S=Significance. Why is the source important? Ask yourself, “So what?” in relation to the question asked.